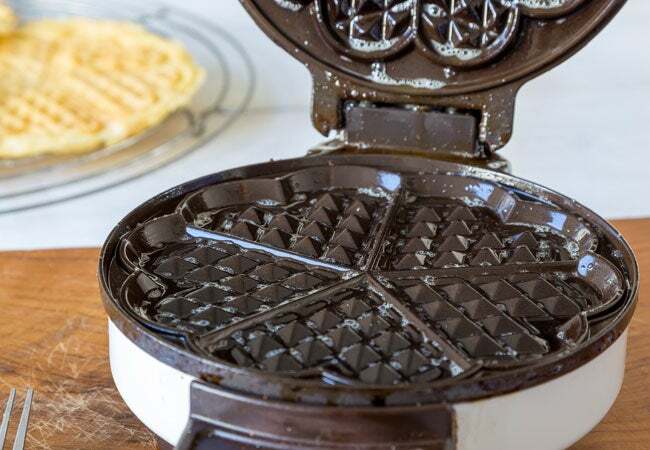 Rid your waffle maker of the remnants of breakfasts past with this handy cleaning tutorial. Few small appliances provide as much tasty fun as the waffle maker. So how come this cool kitchen tool gets little play? Because it can be a bummer to clean! Both the interior baking plates and the exterior are bound to accumulate food debris and grease, which should be removed after every use, lest they emit nasty odors or even burn your next batch. Unless your waffle maker advises otherwise, ordinary dish soap shouldn’t be used to clean the baking plates since it can gradually strip their non-stick coating over time. But with the right supplies and techniques, you can easily banish leftover batter and crud—how you approach the job will depend on whether your unit has removable or non-removable baking plates. Consult the manual if you’re not sure, then read on to learn how to clean the appliance in a jiffy and let it take its rightfully popular place in your breakfast repertoire. 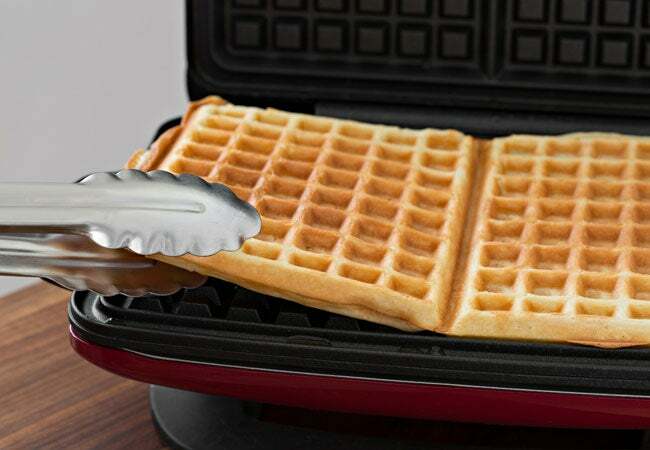 Lift the lid of the waffle maker and use a plastic or rubber spatula to remove any waffles from the baking plates. 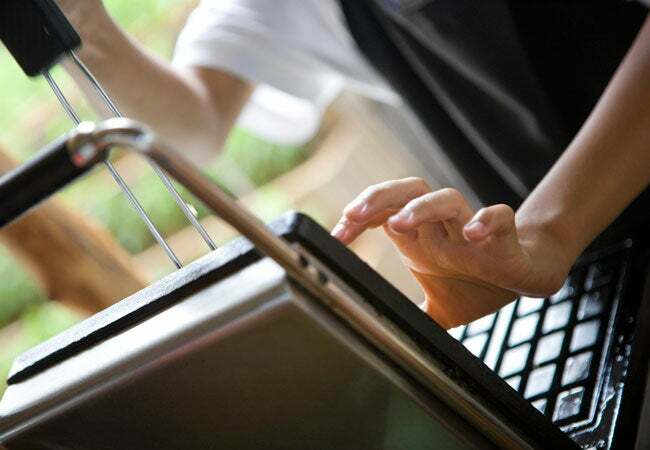 Never use metallic utensils, which can scrape the non-stick coating present on many models. If your waffle maker features a temperature control dial, turn it to the off or 0 position. Then unplug the machine and let it cool completely for at least 30 minutes. Clear the kitchen sink of dishes and then insert the stopper into the drain. Fill the sink halfway with warm tap water. Remove each cooled baking plate by pressing down on the corresponding plate release button located on the side of the unit’s exterior. For example, on a two-plate unit, press the plate release button on the left-hand side to remove the leftmost plate. When the plate pops up from its housing at the base of the unit, use both hands to lift and remove it and immediately immerse it in the sink. Repeat this process for each plate. Let plates dwell in the water for 10 minutes to loosen grease and caked-on batter. After donning gloves, lift one plate from the water bath and use your other hand to gently wipe clean the grooves and edges of the plate using small horizontal strokes of a soft sponge or a soft-bristle brush. (Do not use scouring pads or other abrasive cleaning supplies that could erode the non-stick coating.) Once the side of the plate with the grooves is clean, flip the plate to the other side and gently wipe it down. Rinse the top and bottom of the plate under warm running water to wash away any remaining crumbs, then air-dry on a drying rack. Repeat this process to clean and dry each baking plate, then remove your gloves. Note: Some waffle maker models contain baking plates that are rugged enough to be cleaned in the dishwasher without incurring damage. Always check the manual for instructions on safe cleaning techniques. If in doubt, avoid dishwashing the baking plates to prevent denting or otherwise damaging the plates. Position each clean and dry baking plate in its requisite slot in the plate housing at the base of the waffle maker, then push the plate down with both hands until you hear it snap into place in the slot. Close the lid of the waffle maker and clean the outside of the unit using the procedure “How to Clean a Waffle Maker’s Exterior,” below. Lift the lid of the waffle maker and use a plastic or rubber spatula to remove any waffles. If the unit has a temperature control dial, turn it to the off or 0 position. Then, unplug the waffle maker from the power source and let it cool completely for at least 30 minutes. Using a clean, dry paper towel or cloth hand towel, make a pass over the grooves and edges of each baking plate located at the base of the unit to absorb grease and slough off trapped batter debris. If any residue remains, wet the entire towel with warm water, wring it out until damp but not dripping, then lay the damp towel directly on top of the baking plates and close the lid for three to five minutes. The heat from the towel will loosen stubborn residue. Lift the lid of the waffle maker and use the damp cloth to make a second pass over the grooves and edges of each plate, wiping away any lingering residue. Take another clean paper or cloth towel, wet it with warm water, wring it out, and make a final pass over the grooves and edges of each baking plate in the unit to wipe it clean. 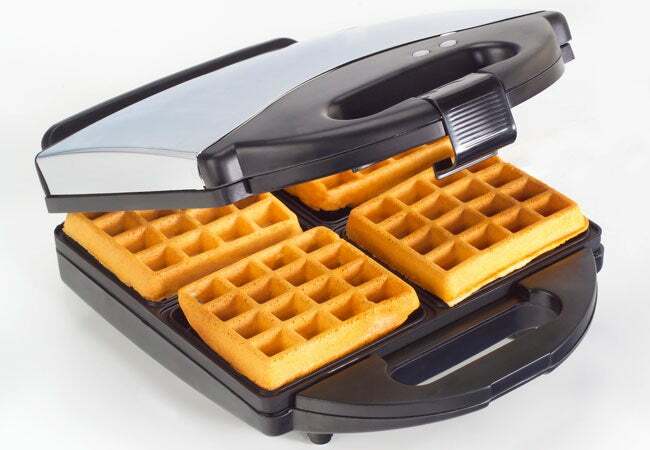 Leave the lid of the waffle maker open for at least 10 minutes so that the plates can dry completely. With the interior plates clean and the unit cool, unplugged, and set to off/0, use a clean, damp paper or cloth towel to wipe down the waffle maker’s lid, handle, and base. Steer clear of electrical components such as the cord port and the cord itself when wiping the base of the unit. Never immerse the unit in water; it can seep into the base and corrode the metal heating elements on the underside of the baking plates. Make a second pass over the lid, handle, and base of the unit with a fresh towel to dry the unit. To store the waffle maker, close the lid, wrap the power cord around the power cord bracket (usually located at the base of the lid), then sit the unit upright on a flat, clean, dry surface where kids or pets can’t reach the cord end and pull it down—the shelves of a high cabinet are ideal.